As a family we love to travel. Travel brings us closer together, gives us wonderful memories and allows us to show our children different places and cultures and expose them to different languages. With travel comes packing. Lets face it, packing for a holiday is a chore. Throw a baby into the mix and can seem quite overwhelming. 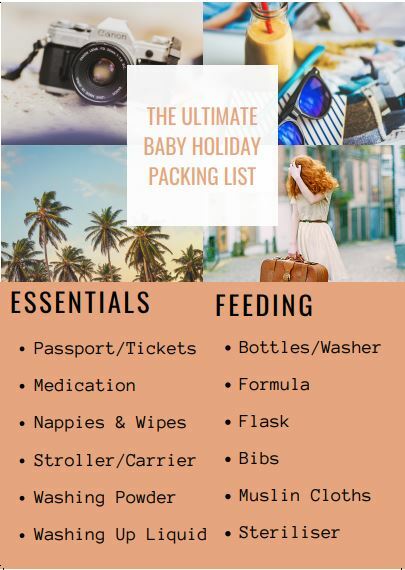 With a little help though, packing for a holiday with a baby can be done quickly and efficiently and let you get on with enjoying your upcoming holiday & planning the fun and exciting parts of your trip. Always spread things equally between the number of cases you have. I know so many people who pack a case for each family member, but if that case goes missing it can create an absolute holiday nightmare. If you pack family cases then even if one does go missing at least you will all have a few essentials and a few outfits spread across all of the other cases. I go one step further and always pack any medication, essential items, a few items of swimwear, a couple of towels and a few changes of clothes for everyone in our carry on cases. Place clothing at the bottom of the case, then place a layer of towels on top then place creams etc inside zipped bags that are placed inside carrier bags on the top. That way if anything leaks the towels may absorb it before it ruins all the clothes. Roll clothes rather than folding. Rolling them takes up less room and creates less creases. Pack a few days before your trip and leave your cases open. That way as and when you think of anything else you would like to take with you it is easy to pop it in and you avoid a last minute rush. Use a packing list. I have lots of packing lists you can choose from. Print off two copies of the list so you know what you need to bring home with you as well! Or take a screenshot or bookmark the list on your phone. This packing list was created with a 7 day Summer Holiday in mind. I always take washing powder on holiday so that items can be washed and reused if needed. Plus its always nice to return home with a case full of clean washing rather than a case full of dirty washing. If you are heading abroad clothes can be washed in the bathroom sink & dried naturally on the balcony or terrace in the sun. If you are heading to the UK washing facilities are usually available.